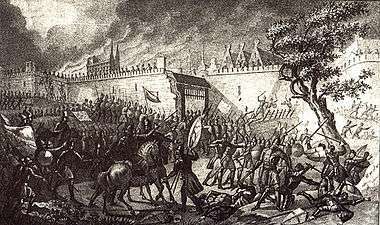 Siege of Narva by the Russians in 1558 by Boris Chorikov, 1836. The Livonian War (1558–1583) was fought for control of Old Livonia (in the territory of present-day Estonia and Latvia) when the Tsardom of Russia faced off against a varying coalition of Denmark–Norway, the Kingdom of Sweden, the Union (later Commonwealth) of the Grand Duchy of Lithuania and the Kingdom of Poland. 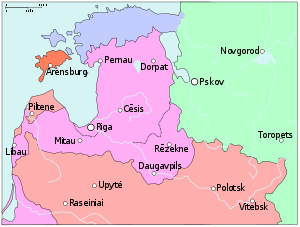 During the period 1558–1578, Russia dominated the region with early military successes at Dorpat (Tartu) and Narva. Russian dissolution of the Livonian Confederation brought Poland–Lithuania into the conflict while Sweden and Denmark both intervened between 1559 and 1561. Swedish Estonia was established despite constant invasion from Russia and Frederick II of Denmark bought the old Bishopric of Ösel–Wiek, which he placed under the control of his brother Magnus of Holstein. 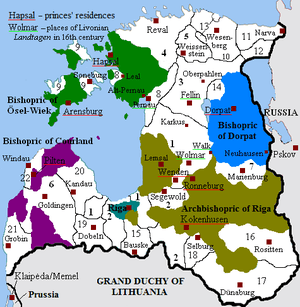 Magnus attempted to expand his Livonian holdings to establish the Russian vassal state Kingdom of Livonia, which nominally existed until Magnus' defection in 1576. By the mid-16th century, economically prosperous Old Livonia had become a region organised into the decentralised and religiously divided Livonian Confederation. 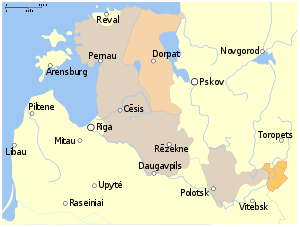 Its territories consisted of the Livonian branch of the Teutonic Order, the prince-bishoprics of Dorpat, Ösel–Wiek, as well as Courland, the Archbishopric of Riga and the city of Riga. Together with Riga, the cities of Dorpat and Reval (Tallinn), along with the knightly estates, enjoyed privileges enabling them to act almost independently. The only common institutions of the Livonian estates were the regularly held common assemblies known as landtags. As well as a divided political administration, there were also persistent rivalries between the archbishop of Riga and the landmeister of the Order for hegemony. [nb 1] A schism had existed within the Order since the Reformation had spread to Livonia in the 1520s, although the transformation of the country into a Lutheran region was a gradual process, resisted by part of the Order which to a varying degree remained sympathetic to Roman Catholicism. As war approached, Livonia had a weak administration subject to internal rivalries, lacked any powerful defences or outside support, and was surrounded by monarchies pursuing expansionist policies. Robert I. Frost notes of the volatile region: "Racked with internal bickering and threatened by the political machinations of its neighbours, Livonia was in no state to resist an attack." By the time the Livonian War broke out, the Hanseatic League had already lost its monopoly on the profitable and prosperous Baltic Sea trade. While still involved and with increasing sales, it now shared the market with European mercenary fleets, most notably from the Dutch Seventeen Provinces and France. The Hanseatic vessels were no match for contemporary warships, and since the league was unable to maintain a large navy because of a declining share of trade, its Livonian members Riga, Reval and trading partner Narva were left without suitable protection. 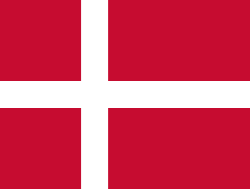 The Danish navy, the most powerful in the Baltic Sea, controlled the entrance to the Baltic Sea, collected requisite tolls and held the strategically important Baltic Sea islands of Bornholm and Gotland. A long bar of Danish territories in the south and her lack of sufficient year-round ice-free ports severely limited Sweden's access to the Baltic trade. Nevertheless, the country prospered due to exports of timber, iron and most notably copper, coupled with the advantages of a growing navy and proximity to the Livonian ports across the narrow Gulf of Finland. 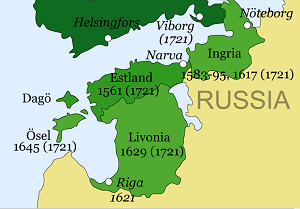 Before the Livonian war, Sweden had sought expansion into Livonia, but the intervention of the Russian Tsar temporarily stalled these efforts through the Russo-Swedish War of 1554–1557, which culminated in the 1557 Treaty of Novgorod. Through its absorption of the principalities of Novgorod (1478) and Pskov (1510), the Tsardom of Russia had become Livonia's eastern neighbour and grown stronger after annexing the khanates of Kazan (1552) and Astrakhan (1556). The conflict between Russia and the Western powers was exacerbated by Russia's isolation from sea trade. The new Ivangorod port built by Tsar Ivan on the eastern shore of the Narva River in 1550 was considered unsatisfactory on account of its shallow waters. Thereafter the Tsar demanded that the Livonian Confederation pay about 6,000 marks to keep the Bishopric of Dorpat, based on the claim that every adult male had paid Pskov one mark when it had been an independent state. The Livonians eventually promised to pay this sum to Ivan by 1557, but were sent from Moscow when they failed to do so, ending negotiations. Ivan continued to point out that the existence of the Order required passive Russian support, and was quick to threaten use of military force if necessary. He aimed to establish a corridor between the Baltic and the new territories on the Caspian Sea because if Russia were to engage in open conflict with major western powers, it would need imports of more sophisticated weaponry. Ivan IV regarded the Livonian Confederation's approach to the Polish–Lithuanian union for protection under the Treaty of Pozvol as casus belli. - in 1554 Livonia and Russia had signed a fifteen-year truce in which Livonia agreed not to enter into an alliance with Poland–Lithuania. In January 1558, Ivan reacted with the invasion of Livonia. The Russians were seen by local peasants as liberators from the German control of Livonia. Many Livonian fortresses surrendered without resistance while Russian troops took Dorpat in May, Narva in July,[nb 2] and laid siege to Reval. Reinforced by 1,200 landsknechte, 100 gunners and ammunition from Germany, Livonian forces successfully retook Wesenberg (Rakvere) along with a number of other fortresses. Although the Germans raided Russian territory, Dorpat, Narva and many lesser fortresses remained in Russian hands. The initial Russian advance was led by the Khan of Kasimov Shahghali, with two other Tartar princes at the head of a force that included Russian boiars, Tartar and pomest'e cavalry as well as cossacks, who at that time were mostly armed foot soldiers. Ivan gained further ground in campaigns during the years 1559 and 1560. In January 1559, Russian forces again invaded Livonia. A six-month truce covering May to November was signed between Russia and Livonia while Russia fought in the Russo-Crimean Wars. Some members of the Lithuanian nobility opposed growing Polish–Lithuanian union, and offered the Lithuanian crown to Ivan IV. The Tsar publicly advertised this option, either because he took the offer seriously, or because he needed time to strengthen his Livonian troops. Throughout 1561, a Russo-Lithuanian truce (with a scheduled expiration date of 1562) was respected by both sides. In 1561, Swedish forces arrived and the noble corporations of Harrien–Wierland and Jerwen (Järva) yielded to Sweden to form the Duchy of Estonia. Reval, similarly, accepted Swedish rule. Denmark dominated the Baltic, and Sweden wished to challenge this by gaining territory on the Eastern side of the Baltic. Doing so would help Sweden control the West's trade with Russia. This helped to precipitate the Northern Seven Years' War since in 1561, Frederick II had already protested against Swedish presence in Reval, claiming historical rights relating to Danish Estonia. When Erik XIV's forces seized Pernau in June 1562, his diplomats tried to arrange Swedish protection for Riga which brought him into conflict with Sigismund. Sigismund maintained close relations with Erik XIV's brother, John, Duke of Finland (later John III) and in October 1562, John married Sigismund's sister, Catherine, thereby preventing her marrying Ivan IV. While Erik XIV had approved the marriage, he was upset when John lent Sigismund 120,000 dalers and received seven Livonian castles as security. This incident led to John's capture and imprisonment in August 1563 on Erik XIV's behalf, whereupon Sigismund allied with Denmark and Lübeck against Erik XIV in October the same year. The intervention of Denmark, Sweden and Poland-Lithuania into Livonia began a period of struggle for control of the Baltic, known contemporaneously as the dominium maris baltici. While the initial war years were characterised by intensive fighting, a period of low-intensity warfare began in 1562 and lasted until 1570 when fighting once more intensified. Denmark, Sweden and to some extent Poland–Lithuania were occupied with the Nordic Seven Years' War (1563–1570) taking place in the Western Baltic, but Livonia remained strategically important. In 1562, Denmark and Russia concluded the Treaty of Mozhaysk, respecting each other's claims in Livonia and maintaining amicable relations. In 1564, Sweden and Russia concluded a seven-years truce. Both Ivan IV and Eric XIV showed signs of mental disorder with Ivan IV and turning against part of the Tsardom's nobility and people with the oprichina that began in 1565, leaving Russia in a state of political chaos and civil war. When the Russo-Lithuanian truce expired in 1562, Ivan IV rejected Sigismund's offer of an extension. The Tsar had used the period of the truce to build up his forces in Livonia, and invaded Lithuania. His army raided Vitebsk and, after a series of border clashes, took Polotsk in 1563. Lithuanian victories came at the Battle of Ula in 1564 and at Czasniki (Chashniki) in 1567, a period of intermittent conflict between the two sides. Ivan continued to gain ground among the towns and villages of central Livonia but was held at the coast by Lithuania. The defeats of Ula and Czasniki, along with the defection of Andrey Kurbsky, led Ivan IV to move his capital to the Alexandrov Kremlin while the perceived opposition against him was repressed by his oprichniki. A "grand" party of diplomats left Lithuania for Moscow in May 1566. Lithuania was prepared to split Livonia with Russia, with a view to a joint offensive to drive Sweden from the area. However, this was seen as a sign of weakness by Russian diplomats, who instead suggested that Russia take the whole of Livonia, including Riga, through the ceding of Courland in southern Livonia and Polotsk on the Lithuanian–Russian border. 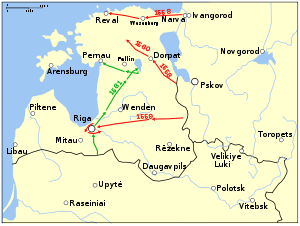 The transfer of Riga, and the surrounding entrance to the River Dvina, troubled the Lithuanians, since much of their trade depended on safe passage through it and they had already built fortifications to protect it. Ivan expanded his demands in July, calling for Ösel in addition to Dorpat and Narva. No agreement was forthcoming and a ten-day break was taken in negotiations, during which time various Russian meetings were held (including the zemsky sobor, the Assembly of the Land) to discuss the issues at stake. Within the Assembly, the church's representative stressed the need to "keep" Riga (it not yet having been conquered) while the Boyars were less keen on an overall peace with Lithuania, noting the danger posed by a joint Polish-Lithuanian state. Talks were then halted and hostilities resumed upon the ambassadors' return to Lithuania. In 1564, Sweden and Russia agreed the Treaty of Dorpat, whereby Russia recognised Sweden's right to Reval and other castles, and Sweden accepted Russia's patrimony over the rest of Livonia. A seven-year truce was signed between Russia and Sweden in 1565. Eric XIV of Sweden was overthrown in 1568 after he killed several nobles in the Sture Murders (Sturemorden) of 1567, and was replaced by his half-brother John III. Both Russia and Sweden had other problems, and were keen to avoid an expensive escalation of the war in Livonia. Ivan IV had requested the delivery of John's wife, the Polish-Lithuanian princess Catherine Jagellonica to Russia, since he had competed with John to marry into the Lithuanian-Polish royal family. In July 1569 John sent a party to Russia, led by Paul Juusten, Bishop of Åbo which arrived in Novgorod in September, following the arrival in Moscow of the ambassadors sent to Sweden in 1567 by Ivan to retrieve Catherine. Ivan refused to meet with the party himself, forcing them to negotiate instead with the Governor of Novgorod. The Tsar requested that Swedish envoys should greet the governor as 'the brother of their king', but Juusten refused to do so. The Governor then ordered an attack on the Swedish party and that their clothes and money be taken, they be deprived of food and drink and be paraded naked through the streets. Although the Swedes were also to be moved to Moscow, fortunately for them, this occurred at the same time Ivan and his oprichniki were on their way to an assault on Novgorod. On his return to Moscow in May 1570, Ivan refused to meet the Swedish party, and with the signing of a three-year truce in June 1570 with the Commonwealth he no longer feared war with Poland–Lithuania. Russia considered the delivery of Catherine to be a precondition of any deal and the Swedes agreed to meet in Novgorod to discuss the matter. According to Juusten, at the meeting the Russians demanded they abandon their claim to Reval, provide two or three hundred cavalry when required, pay 10,000 thaler in direct compensation, surrender Finnish silver mines near the border with Russia and allow the Tsar to style himself "Lord of Sweden". The Swedish party left following an ultimatum from Ivan that Sweden should cede its territory in Livonia or there would be war. Juusten was left behind while John rejected Ivan's demands, and war broke out anew. Quarrels between Denmark and Sweden had led to the Northern Seven Years' War in 1563 which ended in 1570 with the Treaty of Stettin. Primarily fought in western and southern Scandinavia, the war involved important naval battles fought in the Baltic. When Danish-held Varberg surrendered to Swedish forces in 1565, 150 Danish mercenaries escaped the subsequent massacre of the garrison by defecting to Sweden. Among them was Pontus de la Gardie, who became an important Swedish commander in the Livonian War thereafter. Livonia was also affected by the naval campaign of Danish admiral Peter or Per Munck, who bombarded Swedish Reval from sea in July 1569. Under the Treaty of Stettin, Denmark became the supreme and dominating power in Northern Europe, yet failed to restore the Kalmar Union. Unfavourable conditions for Sweden led to a series of conflicts that only ended with the Great Northern War in 1720. Sweden agreed to turn over her possessions in Livonia in return for a payment by Holy Roman Emperor Maximilian II. However, Maximilian failed to pay the promised compensation, and thereby lost his influence on Baltic affairs. The terms of the treaty regarding Livonia were ignored, and thus the Livonian War continued. From Ivan's point of view, this merely enabled the powers involved to form an alliance against him, now that they were no longer fighting each other. During the early 1570s, King John III of Sweden, faced a Russian offensive on his positions in Estonia. Reval withstood a Russian siege in 1570 and 1571, but several smaller towns were taken by Russian forces. At 23 January a Swedish army of 700 infantry and 600 cavalry under command of Clas Åkesson Tott (the Elder) clashed with a Russian and Tartar army of 16,000 men under the command of Khan Sain-Bulat at the Battle of Lode by the village of Koluvere. The Russian advance concluded with the sacking of Weissenstein (Paide) in 1573 where, after its capture, the occupying forces roasted some of the leaders of the Swedish garrison alive, including the commander. This triggered a retaliatory campaign by John centred on Wesenberg, to which the army departed in November 1573 with Klas Åkesson Tott in overall command and Pontus de la Gardie as field commander. There were also Russian raids into Finland, including one as far as Helsingfors (Helsinki) in 1572. A two-year truce on this front was signed in 1575. 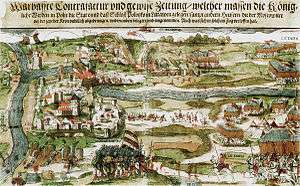 John's counter-offensive stalled at the siege of Wesenberg in 1574 when German and Scottish units of the Swedish army turned against each other. This failure has also been blamed on the difficulties of fighting in the bitter winter conditions, particularly for the infantry. 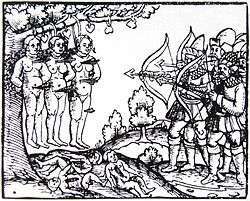 The war in Livonia was a great financial burden for Sweden and by the end of 1573, Sweden's German mercenaries were owed 200,000 daler. John gave them the castles of Hapsal, Leal and Lode as security but when he failed to pay they were sold to Denmark. Meanwhile, efforts by Magnus to besiege Swedish-controlled Reval were faltering, with support from neither Ivan nor Magnus' brother, Frederick II of Denmark forthcoming. Ivan's attention was focused elsewhere while Frederick's reluctance perhaps stemmed from a new spirit of Swedish–Danish unity which made him unwilling to invade Livonia on behalf of Magnus, whose state was a vassal of Russia. The siege was abandoned in March 1561 whereupon Swedish action in the Baltic escalated, with the passive backing of Sigismund, John's brother-in-law. At the same time Crimean Tatars devastated Russian territories and burned and looted Moscow during the Russo-Crimean Wars. Drought and epidemics had fatally affected the Russian economy while oprichnina had thoroughly disrupted the government. Following the defeat of Crimean and Nogai forces in 1572, oprichnina was wound down and with it the way Russian armies were formed also changed. Ivan IV had introduced a new strategy whereby he relied on tens of thousands of native troops, cossacks and tartars instead of a few thousand skilled troops and mercenaries, as was the practice of his adversaries. Following a decision by John, the war with Russia ended in 1583 when the Tsar concluded the Truce of Plussa (Plyussa, Pljussa, Plusa) with Sweden. Russia relinquished most of Ingria but left Narva and Ivangorod under Swedish control. Originally scheduled to last three years, the Russo-Swedish truce was later extended until 1590. During the negotiations, Sweden made vast demands for Russian territory, including Novgorod. Whilst these conditions were probably only for the purposes of negotiation, they may have reflected Swedish aspirations of territory in the region. ↑ De Madariaga 2006, p. 128 says Narva in May and Dorpat in July. ↑ E. Liptai: Magyarország hadtörténete (1), Zrínyi Katonai Kiadó 1984. ISBN 963-326-320-4; 208. p.